Freshfield Lane, Danehill, East Sussex. Grid reference: 540500, 127500, View on: Google Maps, Open Street Map, Streetmap, National Library of Scotland Map or Oldmaps. There are 390 baptisms in the OPC database. IGI Batches: J152021 (1851 ~ 1881); K152021 (1851 ~ 1881). IGI Batch: M152021 (1851 ~ 1881). 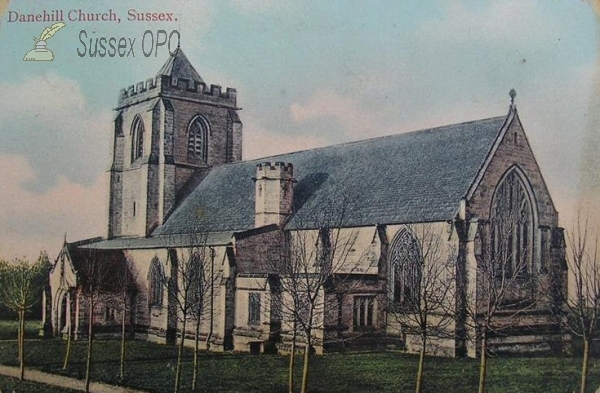 There are 20 images of this church in the OPC database. Architect: S. F. Bodley & T. Garner. Style: Decorated with south west tower. Organ mounted on veranda screen. Replaced an earlier chapel of ease built in 1836 (Perpendicular of red brick with stone dressings on site near the war memorial, designed by John Cowper of Lewes).